Ancient Stones - Borders - 027 Ship Stone, Posso, Manor Valley. 027 Ship Stone, Posso, Manor Valley. 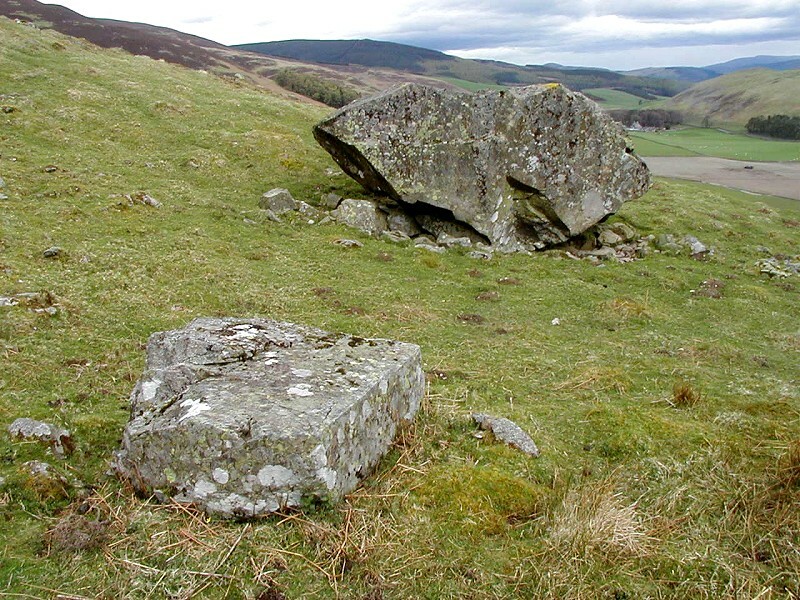 The Ship Stone as noted on Ordnance Survey maps, also known locally as the Boat Stone, is the name given to a large rock that has fallen from Posso Craig in the Manor Valley and is said to be the shape of a ship. The stone is 2.60m high x 6.10m long x 2.10m wide. Take the A72 west from Peebles and turn left for Kirkton Manor. Continue following the minor road up Manor valley. 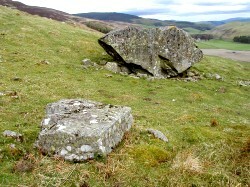 Once across the cattle grid, the stone is on the hillside below Posso Craig. When the Ship Stone fell from Posso Craig is not recorded but carvings on the stone show dates going back to 1801, which if true, would indicate at least 200 years. If the stone was there during ancient times it is possible that such a stone would have held some significance to the tribes in the area. In fact, the hill fort known as Macbeth's Castle, on Wood Hill, opposite Posso has been associated with the Druids. Obviously this is pure conjecture but when you visit the area and see how rich the location is in ancient remains, you might just wonder yourself! A return visit the following year to measure the stone also brought another nearby stone to my attention. A large slab measuring 1.20 x 1.20 x 0.60m high can be seen some 6.00m south of the Ship Stone. It has been suggested that this stone may be associated and is, in fact, an altar stone, used when pagan rituals took place here. Probably pure fantasy but who can really know for sure? 028 Font Stone, Kirkhope, Manor. 029 Marked Stone, Manorhead, Manor.